This week, #Unlocked17 is visiting Dungavel, Scotland’s only detention centre. 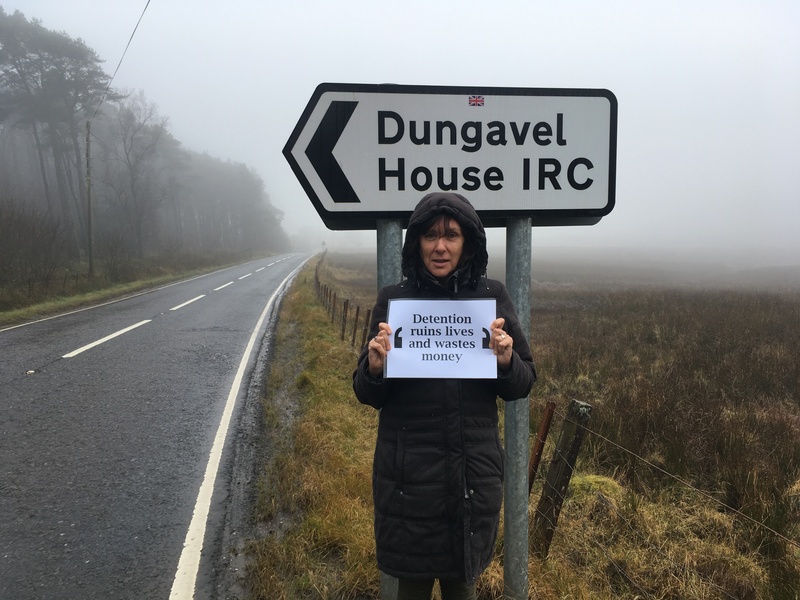 In this blog, Kate Alexander, Director of Scottish Detainee Visitors (SDV), reflects on another year of visiting Dungavel, and takes us on the journey that visitors make twice a week. Visitors also prepare a report after every visit, which Kate reviews. Here, she highlights the patterns she sees in these reports: of visitors’ concerns about the health of those in detention, frequently linked to the length of time people have been detained; of people’s frustration, anger and distress at their detention and the complex immigration processes they are caught up in; and of their worries about their families on the outside. To learn more about Dungavel, follow SDV on Twitter (@SDVisitors). SDV often tweet extracts from their visitors reports, providing a much-needed insight into the daily struggles of life in detention. 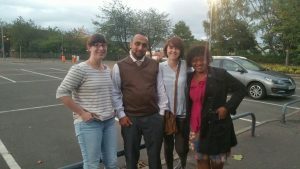 For Unlocking Detention last year, I wrote a blog about the future of detention in Scotland. The situation was very uncertain. The UK Government had announced that it would close Dungavel, but its plans to build a short term holding facility (STHF) at Glasgow Airport were in disarray following Renfrewshire Council’s refusal of planning permission. The Government had a right to appeal the decision in Renfrewshire and for a time it looked like other sites were under consideration for a STHF. As an organisation, SDV were considering how we might adapt to provide a service to people in a new facility. As things turned out, in February this year, the Government quietly announced that Dungavel would stay open. 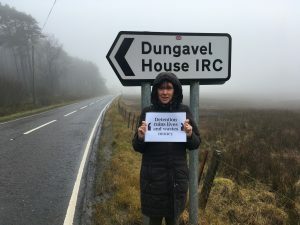 So to our surprise, given where we were this time last year, we can look back on another year of our visitors travelling to Dungavel every week to visit, support and offer solidarity to the people detained there. This blog is about that work. Every detention centre is different and as a result every organisation supporting people in detention works in a different way. 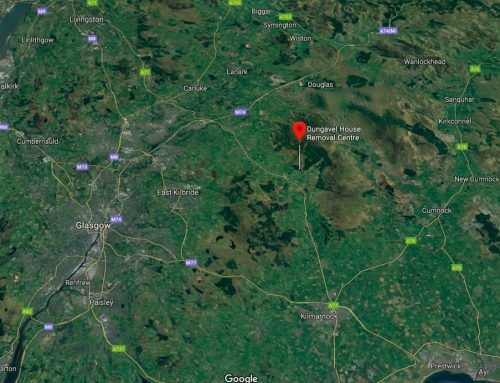 Dungavel’s location, 45 minutes south of Glasgow, along a country road, on no public transport routes means that the only practical way for our visitors to go to Dungavel is by car, so they drive to Dungavel two evenings a week in groups of up to five. Each visit starts with a meet-up in central Glasgow (or sometimes Edinburgh) and a drive out of the city and along the country roads that lead to Strathaven, the nearest town to Dungavel. 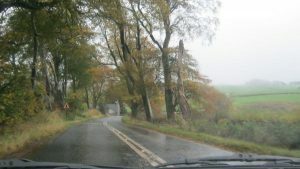 We then travel six miles further along the road, through open country and farmland. Finally, Dungavel comes into view, but it would be really easy to miss if you didn’t know it was there. It’s set back from the road, hidden behind trees. 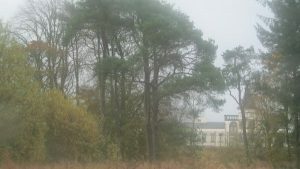 Its history as a hunting lodge for the Dukes of Hamilton explains this and also its unusual appearance compared to many centres in the detention estate. It looks like a rather down at heel country estate – a large white building with turrets set in what would once have been attractive grounds. Once they have parked, visitors ring a bell outside a cage-like structure built into the high perimeter fence, topped with barbed wire. The door to the cage creaks open and they all go inside, the door clanks closed behind them and they wait inside the cage at an inner gate until a member of Dungavel staff comes to check their ID and let them inside the perimeter fence. The wait can be quite long. Sometimes 15 minutes or more. In the winter it can be very cold, and in the summer they can be prey to the infamous Scottish midge! Finally, an officer takes them through to reception and books them in, a process that can also take some time. Each visit has an organiser who gives the officer the names of the people they want to visit so they can be called to the visit room. Everyone is searched and ushered through to the visits room, where they wait until people come down to meet them. After every visit, our visitors prepare a report of the visit and this allows us to monitor what we do and who we see in Dungavel. At the end of every quarter, I sit down and go through all the reports and record the information they contain. It’s a task I really like doing, because I like spreadsheets and numbers and it allows me to collate really useful information for our funders and means we can track trends. From the reports we know that in the first three quarters of 2017, our visitors made 76 visits to Dungavel and saw 155 people, 28 women and 127 men. 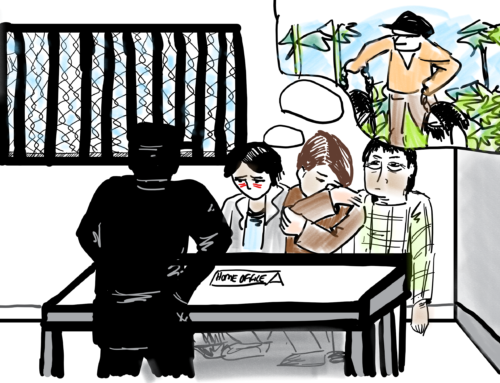 We try and strike a balance between visiting people who have been newly detained and people who have been in detention for weeks, months and sometimes years. We also try to prioritise women. 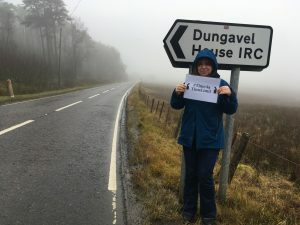 There are only 14 places for women at Dungavel, compared to 235 for men, so women can feel particularly isolated and stressed while they are detained there. We see an average of seven people per visit, but each visit is different and our visitors have to be prepared for seeing anything between two and fifteen people. We saw people from 36 different countries in the first three quarters of this year and a quarter of them were from the EU. In fact, Romanians formed the biggest single nationality among the people we visited until the end of September. The most recent detention statistics from the Home Office show that this is a trend across the detention estate – twenty per cent of people entering detention in the first three quarters of 2017 were EU citizens, but for people entering detention in Dungavel, the figure was higher at 35%. People from China, India, Vietnam and Sudan were also seen in large numbers. Perhaps surprisingly, we also saw people from the USA, Brazil and Bolivia. But the reports also tell us more. Visitors use them to let other visitors know about problems the people we see are facing, or to share their concerns about them. And it’s this information that tells us most about the harmful impact of detention. “T is a priority for visit. He’s lost a lot of weight, isn’t eating well and seems very stressed”. Frustration and distress about indefinite detention can be linked to confusion about the complex immigration processes people are caught up in. While detained at Dungavel, people have better access to legal support than in other centres, but still people find it hard to get legal advice and to understand what is happening to them. I’m really proud of the work our visitors do supporting people in detention. But every time I analyse their reports I’m angry that they have to do it. All of the sadness revealed is a direct result of UK Government policy. And we know it doesn’t have to be like this.